It’s hard to type when one’s feet refuse to stay on the ground. I still keep floating around from the euphoria of seeing two awe-inspiring concerts on the weekend, both by the same ou. I’m talking of course about Rodriguez who finally performed to his many South African fans and it’s difficult to decide who was more overawed by the confrontation. Rodriguez had not performed since 1981 and even those concerts, in Australasia, did not nearly attract the same fans as the SA concerts, so, when Rodriguez walked out onto the stage at the Bellville Velodrome, he almost staggered backwards from the roar and vibes that poured onto the stage from the first night crowd. The performance that Friday night was fine if a little patchy but no-one seemed to notice. Rodriguez forgot the odd line and on a few occasions played at a different tempo to the band, who very professionally managed to plaster over these musical cracks. The second concert on Saturday night, however, was wonderful. A far larger crowd arrived due obviously to a strong local word-of-mouth promotion. Rodriguez and his band were prepared and well-rehearsed and once again the crowd maintained a remarkable level of energetic approval and non-stop singing to each and every song. All the age groups were represented, from 60-year-olds to young children, all caught up in the magic of the moment, signifying indisputably that Rodriguez’s music has passed the test of time and is not simply a ’70s phenomenon. The response to these concerts was repeated throughout the tour. The two concerts in Johannesburg at the Standard Bank Arena were sold out and generated the same fanatical and ecstatic reaction. One of the Durban dates was replaced by a show at the Carousel complex outside Pretoria and that too was full. There is a strong feeling that this remarkable tour could be the spark that hopefully kick-starts Rodriguez’s long overdue world-wide recognition. Through the Internet, his fans all over the world have been closely monitoring these events in South Africa and requests for tours have been received from as far afield as Australia, Canada, England and the USA. Some United States newspapers have already started making enquiries, sensing a story in all of this! Rodriguez is a humble, intelligent and sensitive man who deserves all the recognition he will no doubt be receiving. After both the Cape Town shows, he mingled with the assorted press and fans who had lingered backstage to meet him and shook hands, hugged, spoke to and signed autographs for each and every one of them until he was satisfied that no-one had been overlooked. As they say in Yiddish, he is really a mensch! I am still quite overwhelmed by the whole Rodriguez situation. We all believed he was dead but he most certainly wasn’t and here he was recreating his music that meant so much to so many people for so long. I will always remember singing along to all those songs that are so deeply embedded in my/our memories, but three special memories stand out for me. The first was seeing Rodriguez’s two daughters, Eva and Regan, sitting at the foot of the stage watching their father perform. 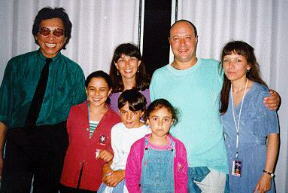 Eva was a teenager when Rodriguez toured Australia and Regan was much younger. The pride and joy that radiated in their faces was quite beautiful.